Willingen is located in the heart of the High Sauerland in a beautiful low mountain landscape. Situated just a few kilometres from the centre of Willingen is the tranquil town of Schwalefeld, with its delightful cycling and hiking trails and cross-country skiing routes. 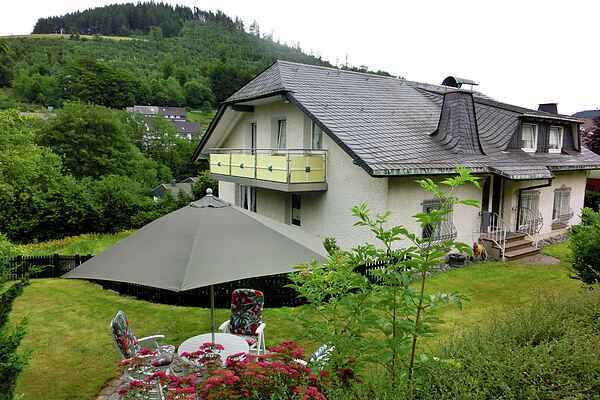 Here in this apartment, you can enjoy the peaceful tranquillity, the proximity to Willingen and most of all the offer peaceful, very well maintained accommodation. This large property is both modern and functional and is finished to high specification. It comprises two separate accommodation units directly next to each other. The accommodation is therefore also ideal for several individual wanting to holiday together while having use of their own living area. Each part of the accommodation has its own separate balcony with delightful views over the green landscape and the town. In the garden adjoining the house there is a parasol and loungers where you can relax, play table tennis and play games or sunbathe on the large lawn. In the winter, Willingen is an Eldorado for downhill and cross-country skiiers. Willingen offers plenty of leisure opportunities: lagoon experi3ence pool, indoor climbing, crazy golf, a wildlife and leisure park, and much more! Popular excursions include: Edersee (45km), Diemelsee (20km), Bad Arolsen castle, Kassel (60km), Paderborn (50km), Winterberg (25km), Korbach (20km), Fort-Fun theme park (40km).